In space, enemies can come from any side. And so rigorous armor is needed in addition to heavy armaments. 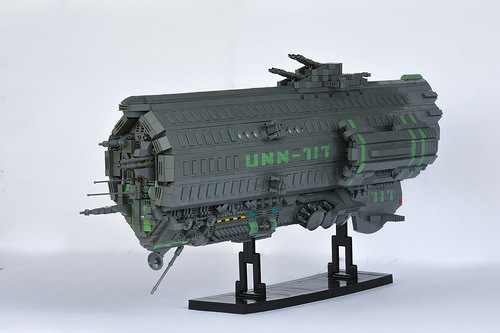 Enter Patrick Massey‘s UNN-717 Olympia, replete with rows of chunky armor paneling and heavy turrets and a subtle submarine vibe (complete with rudder and diving planes). The nearly unbroken grey of the ship’s hull lends weight and scale to the model, helping it convey the ship’s monstrous size. And speaking of size, the LEGO model is no slouch either, ringing in around 3 feet in length.